Europeans are getting poorer, do you care? Is the nation-state still the most viable form of political community or have the pressures of globalization reduced its possibility to maintain the well-being of its citizens in such a manner that we should look to a larger community of reciprocal solidarity, namely Europe? In Athens, Greece. Flickr/Mehran Khalili. Some rights reserved. The International Federation of the Red Cross and Red Crescent Societies has just released a damning report on the way that European Governments have not only handled the current crisis but approach poverty and deprivation in general. The conclusions are summed up in one line: “Whilst other continents successfully reduce poverty, Europe adds to it”. I have written elsewhere about how austerity policies are having a devastating impact on public health and overall well-being, especially in Southern Europe (The Red Cross report also points alarmingly to increased deprivation and desperation in countries in rich northern countries like Germany and Denmark). The excellent work by public health economists David Stuckler and Sanjay Basu, in their book The Body Economic: Why Austerity Kills, documents the impact of austerity measures on public health with shocking detail. From a growing body of evidence on the topic one conclusion is easy to draw: austerity policies are worsening the overall well-being of a great many if not most Europeans. But, should we care? This question has to do with the boundaries of our political concern and solidarity, and it is, I think, one of the most important “European” questions; one that all residents of this continent should ask themselves. The future of the identity and mission of the European Union, but also of each of its member states, rests to a large extent on the response that we give. Let’s take a step back to get a clearer picture of the question and the stakes involved. People in Europe may be getting poorer and this undoubtedly has many negative consequences on their well being, but a quick look at the Inequality Adjusted Human Development Index (the United Nation’s measure of national well-being) reveals that nearly all the countries in the top 20 are in Europe. Europeans may be getting poorer and in some cases a lot poorer, and this may have terrible human consequences, but overall Europeans are much better off than most people in the world. 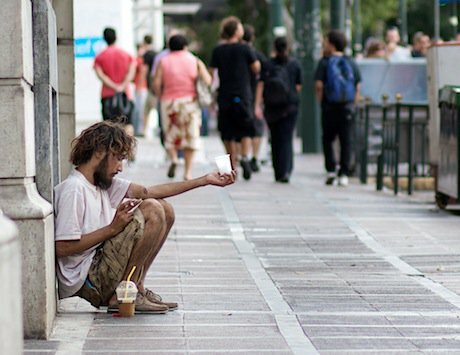 So should rising European poverty really be at the centre of our domestic political concerns? A remark that IMF chief Christine Legarde made in a 2012 interview with the Guardian brings the question into clear relief: Legarde said that she had more sympathy with victims of poverty in sub-Saharan Africa than Greeks hit by the economic crisis. She justified her statement by accusing all Greeks of being tax-dodgers. Setting aside the mendacity of Legarde’s reasoning (she knows full well that the big tax dodgers in Greece have not felt the bite of the crisis) her comment does touch upon a moral principle that will likely make sense to most people. Surely our concern and sympathy for suffering should be directed at where the suffering is greatest? Quality of life for many Europeans may be getting worse (and that’s a bad thing), but they are still on the whole a lot richer and better off than most people in this world, and it’s where people are worse off that we should be most concerned? As a moral principal I think that this may be reasonable, as a political one I think it is not. Most people who accept that a principle of democratic solidarity places some obligations and constraints on our actions will I think also accept that the bonds of political solidarity are strongest between those who have entered into a kind of acknowledged political community with one another. Christians, for example, may claim a universal solidarity with the entire brotherhood of man, but this is a moral principle and a moral community. When it is translated politically, some order of priority becomes necessary, if for purely institutional reasons. The phrase ‘think global, act local’ springs to mind. In modern democracies the nation-state is meant to function as precisely such a solidarity boundary. I would think it odd and contrary to the idea of democratic solidarity if my national insurance payments went only toward funding the health care of people in Bristol (where I live), or worse only funded the care of other atheist American residents of southwest England (my ‘religious’ and ‘ethnic’ grouping). I balk at these possibilities because for all sorts of historically contingent reasons I accept the nation-state as my immediate sphere of political solidarity, even though I am a recent arrival to this particular one. At the other end of the spectrum, I may still care a great deal about poverty and deprivation in sub-Saharan Africa, but I think that politically speaking it’s a different type of concern. Political solidarity depends a great deal on reciprocity. It is acknowledged sharing of responsibility and obligation that binds us together in political communities. It also depends a great deal on the community being able to function in very concrete ways. If my friends and I decided to opt out of national insurance and form our own health service on a much smaller scale, I wouldn’t expect we’d get very far – our new political community would likely start to fray after the first bout of man flu. What I call the European solidarity question is this: Is the nation-state still the most viable form of political community or have the pressures of globalization reduced its possibility to maintain the well-being of its citizens in such a manner that we should look to a larger community of reciprocal solidarity, namely Europe? There are other possibilities, we could argue for a return to much smaller institutional communities, or our moral principles might compel us to try and extend the sphere of political solidarity to the whole world. However, for us at this moment the two most evident institutional possibilities are the nation state or Europe. In the latter, the suffering of a child in Greece should mean the same to us politically as the suffering of one down the block. We should no more tolerate the denial of health care to the unemployed in Athens than we would in London. To a very large extent, I think that this is a matter of political choice. It is clear from reports like the one issued by the Red Cross that the EU Institutions (which are guided by the governments of the member states) do not see their role in this way – in fact the denial of health care to unemployed people in Greece is part of the bailout package agreed by the European Commission and Central Bank. But in a democratic society, the power lies with the people to determine the scope of their political solidarity.